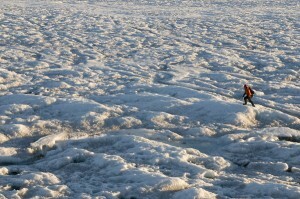 Greetings from the Greenland ice sheet! A lot has changed since my last post. Instead of shorts and a t-shirt, now I’m wearing double socks (which I thankfully did not forget), thick rubber boots, long underwear, waterproof pants, a long-sleeve fleece, fleece vest, and a waterproof shell. Oh, and don’t forget the hat and gloves and glacier goggles (very dark sunglasses). It has been quite a journey—a commercial flight from Seattle to Scotia, New York, then a military airlift flight to Kangerlussuaq, Greenland, then an Air Greenland flight to Ilulissat, and finally a 20-minute helicopter flight to our campsite on the flanks of the Greenland ice sheet. A lot has happened since we arrived on Thursday. I can’t possibly describe it all here, so be sure to visit the Polar Discovery website to see daily photo journals. The most exciting event happened over the weekend. The science team is here to study the lakes that form on top of the ice sheet, how they drain, and what effect this has on global sea level rise. When we arrived, the researchers were surprised that the lake (roughly 2.5 km in diameter) hadn’t yet drained. There were whitecaps on the lake, and you could hear the sound of waves from our campsite. That all changed yesterday in the space of about 12 hours. Last night, just after dinner, we heard a BOOM coming from the lake, then another BOOM, and the gushing sound we had been hearing since noon (like a big waterfall) intensified. We immediately began running towards the lake edge. You could feel the cracks opening up below, sounds like rifle shots going off, alternating with booms in the distance like thunder and really creepy swooshing sounds in every direction. After about a half hour, the sound changed. University of Washington glaciologist Ian Joughin swore he could feel the ice rise slightly, and a noise like “snap, crackle, pop” started issuing from the ice. 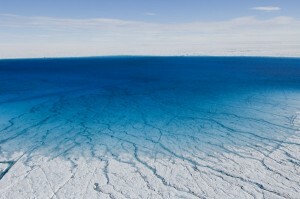 The research team speculated that the lake water, having finally made it to the bedrock, was shoving the ice upwards. Imagine if you shove a cheesecake upwards from beneath—it’ll crack at the surface, right? Well that’s what happened. There were new cracks forming everywhere; most of them were only a fraction of an inch wide, but running for hundreds of feet into the distance. Meanwhile, the lake level continued to drop steadily. After a few minutes of standing in shell-shocked awe (and jumping into the air every time a crack opened nearby), everyone rushed to gear up. This time, we put on hard boots and crampons. The lake bottom ice is very slick, and hasn’t been eroded by the sun like the ice on the sun-weathered ice sheet. With GPSs in hand, we scampered off along the lake edge, pointing out new cracks and listening to the steady booms and pops in the distance. Thankfully, the snap, crackle, pop sounds had stopped, and Ian, Sarah, and Mark agreed that it was likely that the slug of water had moved on and was no longer pushing up on the ice sheet. After a few hours of moving slowly around the lake, we found the culprit (to be more accurate, one of the culprits)—a massive crack with no bottom, deep blue in color down the cleft, running right into the lake. A few small waterfalls were still pouring water into the crack. At that point it was close to midnight, so we headed home, and are hoping for clear weather so we can investigate the new cracks further. 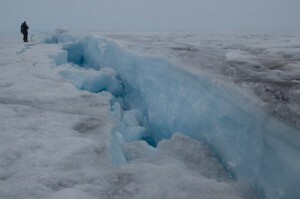 Everyone is excited—it is likely that no one has ever observed a glacial lake drain like this in person. Not only did we see it happen, but also captured the event with high-precision GPS recorders and seismometers. Be sure to visit HMNS on July 21 to talk to us live from the ice!